So you start out reading a statute book of some of the very first laws in a jurisdiction, and practically the first thing you come across is a special law authorizing the movement of some prisoners awaiting trial for murder from one county to another. Maybe you can resist going on to find out more, but The Legal Genealogist can’t. That’s just too tempting. 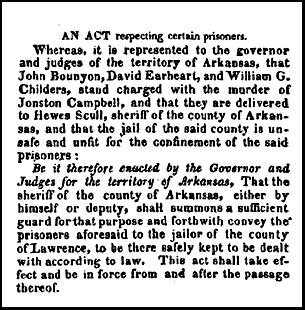 The laws were those of the Territory of Arkansas, and this particular law was one of the very first laws ever enacted there — before the new territorial legislature could even meet. So… we know there was a murder. We know Earheart and Childers were charged with murder and that John Bounyon was a witness, that Hewes Scull was the sheriff but his jail was lousy, and that Samuel Lemmons was out $132 for keeping, guarding and, presumably, feeding the three. Now tell the truth: you didn’t really expect to find a story like that in a dusty old law book, did you? Even though I keep saying those dusty old law books are just chock full of stories like this. And if you were a descendant of any of these people — the victim, the alleged killers, the witness, the sheriff, the guard or the politicos — you’d want this for your family history, wouldn’t you? Bottom line: statute books are astoundingly good resources for genealogical research. Not just because we have to understand the laws in order to understand the records — but precisely because, so very often, we come across stories like this. What, you’re expecting the rest of the story? Flint and other sources all note that the defendants were captured, and taken to the nearest court in Arkansas Territory for trial. So what happened to them afterwards? Can’t find a single reference or document. If you know, or if you find out, let me know, will you? I too would love to know the rest of this story. I am wondering if you could offer a strategy for how to find early laws for states and territories, aside from visiting a law library. Is there a good search term to use online, or in a library catalog? What is your typical methodology? Thanks for sharing!